NEW YORK CITY, June 27, 2017 – Manuel Serrano Plowells (Mexico) tested positive for recombinant EPO during an out-of-competition control (OCC) conducted in concurrence with the Campagnolo GFNY World Championship in NYC on May 21, 2017. Plowells admitted to having used the substance, which is banned under WADA rules. He is disqualified from the race and receives a lifetime ban from all GFNY events (Rule 9.3). This is the fifth positive doping control in GFNY’s short history. GFNY established doping controls in 2012 and is the first event open to amateurs that also institutes out of competition tests. In 2012, David Anthony (NYC) and Gabriele Guarini (Italy) tested positive for EPO at GFNY after winning their respective age groups. In 2015, first overall finisher, Oscar Tovar (Colombia), tested positive for Testosterone, as did Yamile Lugo (Colombia), who came third in the women’s race. In addition to a lifetime ban for dopers at GFNY races, the race’s rules also state that a rider who tests positive at GFNY has to reimburse the cost of the doping test. Furthermore, such rider has to reimburse GFNY for any damages to its reputation that are a consequence of the positive doping control. If the rider is part of a team participating at GFNY, the team can be held liable for this damage [GFNY rules]. 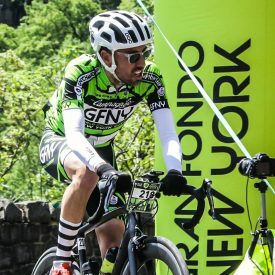 A rider who is currently banned by WADA from competition may not participate in any GFNY event. After the ban, he/she is allowed to participate but has to start at the back of the field, will not be timed and will not be in the results. This allows for social reintegration despite a lifelong ban from competing. Several riders have taken part in GFNY over the years in this way. Since 2015, GFNY also randomly checks bikes for motors. Current technology allows to invisibly integrate inaudible motors into the frame that produce up to 250 Watts for 30 minutes which increases a top rider’s output by more than 50%. GFNY is the global cycling marathon brand with events held in NYC, Argentina, Brazil, Chile, Colombia, Costa Rica, Germany, France, Indonesia, Israel, Italy, Malaysia, Mexico and Uruguay.